We are regularly selling our stunning cyclamens in store. Our grower at the market provides us with a quality product that thanks to their interesting foliage you or your loved one can enjoy in your home year round. If you’re unsure how to look after them don’t fret, we’re here to help you with some tips for keeping your cyclamens looking great! Cyclamens are well suited to the climate of the Southern Highlands, they love a cool, dry environment and are best kept indoors in natural, filtered light. Here are some steps to getting the best out of your plant. Place your cyclamen in a position inside that gets some natural light from a window. You don’t want them to be in full sun as this is too hot for them and can burn the plant. They will be happy to be in the shade for the better part of the day but will need some filtered light to continue flowering. 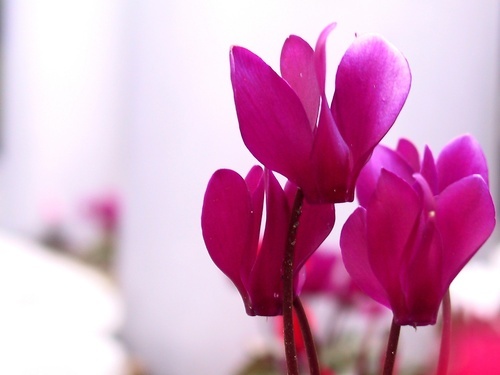 Keep your cyclamen in a position out of drafts, heat from fireplaces and air conditioning. It prefers a more temperate area that is dry and away from moisture. Bathrooms are not an appropriate room for a cyclamen as the air is too humid. We would also advise against a very hot room such as the living room where the plant is subject to frequent changes in temperature. Hallways, entrances, bedrooms and kitchens are where the cyclamen will be most comfortable. Water your cyclamen once every week, and less frequently in Winter (roughly every ten days). It should stay moist but not wet and a good indication of when they are feeling a bit thirsty is if the flowers are looking a little droopy. They should perk up once watered if this happens. Frequently check your cyclamen for tired flowers. If a flower discolours or is drooping remove it from the plant by plucking from the base of the stem. This will encourage the plant to continue flowering as it no longer needs to provide energy to the dying flower. Your cyclamens will love a vacation outside every now and then, once or twice a week, to an undercover area protected from frost and drafts. They enjoy the cool shock and the crisp air of the Southern Highlands is perfect for this. Leave them overnight and place back in their home in the morning. Should the leaves yellow on your cyclamen try placing them outside for the night as previously mentioned and avoid over-watering them. The yellowing leaves are an indication that your little guy is in distress so take care to pay attention to the cyclamens needs. Yellow leaves indicate either too much moisture, that they are too warm or not getting enough natural light, whereas droopy flowers indicate that the plant needs some water. Be careful not to mistake an individual tired flower for a droopy, thirsty plant as you really want to avoid over-watering. Enjoy your cyclamens, with attentive care they are a beautiful indoor plant and relatively easy to look after if you understand what the plant needs. Should the cyclamen look like it is outgrowing it’s pot or looking a little sad indoors, definitely consider planting outdoors as an undergrowth or ground cover in the garden under shrubs and trees, in shade or filtered light. If you’re having trouble with planting and fertilising your plant we definitely recommend heading to your local nursery to have a chat with a horticulturist and to have a look at what products they have to help your cyclamen thrive.